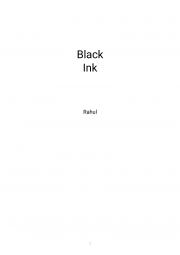 Description of "Black ink (eBook)"
This is my poetry book which includes social issues which we are facing in our day to day life. You will love to read the word and scenes used by me in poem. Rahul dhole is a young author of a book BLACK INK also love to write on the social issues faced by all of us in our day to day life. Reviews of "Black ink (eBook)"